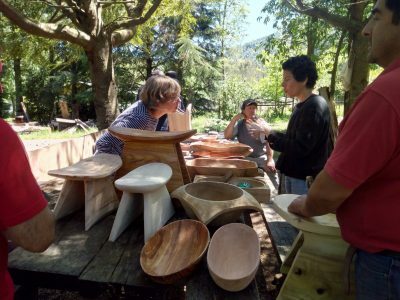 As part of the British Council Crafting Futures programme AAS is able to nominate makers for other projects, and through this Scottish furniture designer Isabelle Moore was offered the exciting opportunity of participating in a residency in Chile in a traditional wood carving community in the town of Liquiñe. We asked her to tell us more about her experience. What was the town like that you stayed in? 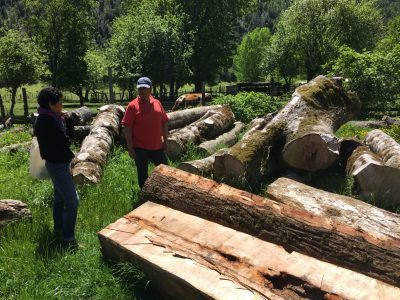 We were guests of a traditional wood carving community in the town of Liquiñe, a tiny valley town in Los Ríos Region, 350 miles south of Santiago and 15 miles from the Argentine border, mountains and volcanoes encircling the horizon. 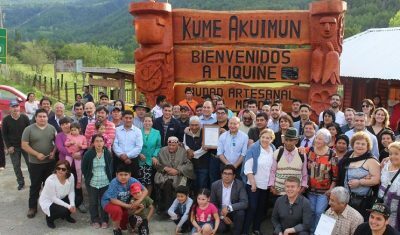 The Liquiñe folk were direct, gracious and extremely courteous, working with creative ingenuity and astonishing hard graft evidenced by the volume of work they produce. 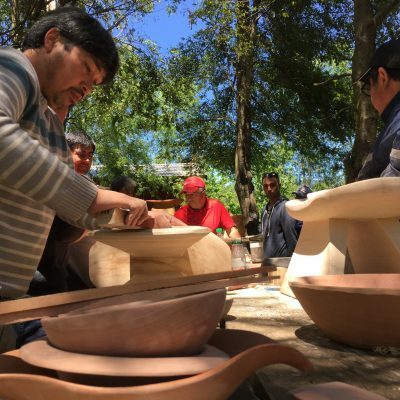 The town is a recent recipient of the UNESCO World Craft Town Award, acknowledging the skills and techniques passed down through the generations of Indigenous Mapuche woodcarvers in this region (similar to the tweed weaving community on Harris). Theirs was a valley of wood and wooden structures, without the material diversity of the west and technological choice more readily accessible in our built environment. The vernacular construction of one or two storey cabin homes, each with its wood burning stove and smoke rising in a communality of comfort, as dusk settles. The homesteads were built from local timber with individual workshops and drying rooms adjacent. It was properly spring with the days stretching longer and warmer, with chicks finding their feet both inside the workshops and out. Water everywhere, torrential night time downpours, the omnipresent waterfall at the head of the valley cascading glacial snow melt into the tributaries of the Liquine River, etching the valley floor. Were you based in a studio space and where was the accommodation? We worked throughout the valley, visiting each of the 18 of the workshops in turn that were located adjacent the Artisan’s homes. Group gatherings were held either at the local government office or under the pines on the capacious picnic table at Luis’s home. We stayed in a log cabin with wood burning stove in Nelda Trafipan’s property, whose local comida rica – (delicious cooking) and award winning hospitality were a complete treat. Did you find any challenges in communicating, in general and with the craftsmen? I was extremely grateful to designer Claudia Betancourt from Sanitago, who was the collaborating resident on this project. Her generous understanding of Chilean craft and insight into the nuances of the culture were fundamental in communicating effectively with the wood carvers and understanding how best we might assist each group or individual maker. In the absence of a local intermediary, it was difficult at times to gauge whether or not some cultural differences went unacknowledged. My high school Spanish improved dramatically over my time there. What surprised you most about working with the craftsmen? The collective importance of expressing their cultural traditions and values, through the types of objects they make and how they make them – simultaneously transferring knowledge and traditional culture through the generations whilst supporting the community at large. Their visible, cyclical connection to their immediate environment through their work and lifestyle was in evidence. They were busy building stock to sell for the imminent high season so we were privileged to have so many engage with the programme, developing new work, in spite of their on going workload. What is different and special about the Mapuche woodcarving techniques? 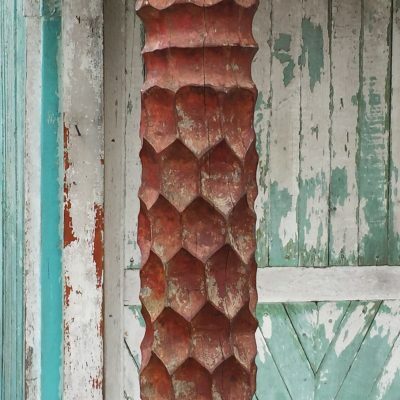 The Mapuche culture and their work is a fundamental expression of their connection to nature and their wider environment and the makers have a direct connection to the process, in its entirety: from harvesting and selecting their timber locally to realising their time honoured designs. It seems much of indigenous Chilean craft is identified with the areas in which the specific raw materials are harvested and different regions are celebrated for their specialties. Wood selection takes place in the surrounding hillsides, chainsaws are used to process materials and rough cut into blanks to begin the drying process. Each piece is crafted in a subtractive process from a solid piece of green timber, using adzes, gouges and sanding and no glue. Their work is typified by their formal vocabulary of objects with minimal ornamentation apart from the rhythmic carved surfaces referred to as lampeada (photo on left). The objects they create are generally developed from traditional objects used daily: guankos – low stools, morteros – mortars, fuentes – trays, bowls or ceremonial forms such as flutes and masks. What work did you make during the residency? In contrast to all previous residencies I made no work during my three week stay, only drawings. The brief for this Crafting futures residency was to explore ways that the Artisans in Liquiñe might broaden their visibility, authorship whilst increasing potential markets for the work they create. This time around, I had the time to look and learn, assimilate this unfamiliar territory and contribute differently. We looked at areas where each Artisan might develop their personal styles or range of products. Ways in which they might encourage sales and workshop visits (through the publication and distribution of a Liquiné workshop map) and a branding stamp for provenance of the volumes of work produced in this town (usually distributed far and wide with no acknowledgement of its source). In addition to this Claudia and I began organising the exhibition at END, Espacio Nacional de Diseño, Santiago celebrating the makers and their work. Would you like to go back to Chile and visit the craftsmen again? It would be an honour to visit again to see how the visibility of their World Craft Town status and further sales opportunities in Santiago has impacted the ways in which they work. What influence has this experience had on your work?